To establish liaison with Academic institutions in North America that are promoting or willing to promote the study, teaching and research in the principles, philosophy, culture and history of Jain Dharma. Jainism is least known and most misunderstood in academia and in the general public. Study of Jain dharma and the Jain community has not been on the radar screens of the academia and as a result, the study of Jain dharma has significantly lagged behind that of other religions in the colleges and universities of North America. Lack of younger and English speaking Jain studies scholars’ availability. Lack of viable structure to train new scholars. Some initiatives are showing promising results. 1. Create, nurture, educate and enhance Jainism awareness in academia by various means. 2. Develop & facilitate English speaking scholars training, availability in US Academia. 3. Encourage younger Jain scholars to be trained by various means of scholarships, fellowships, and increased employment opportunities in academia. 4. Facilitate, encourage participation and collaborative atmosphere with Jain community and academic institutions. 5. Develop a dialog with and facilitate the promotion of studies in Jain dharma by encouraging the establishment of Centers, Institutes, Chairs and Professorships in Jain dharma at Academic Institution across North America. 7. Increase stature of these efforts to bring Jain studies a respectable place in academia by all available means such as funding, travel opportunities and focusing on the target audience. Following the recent signing of the agreement between the Jain Education and Research Foundation (JERF) and the University of North Texas (UNT) for the establishment of an endowed professorship of Jain Studies, the formal announcement of the professorship will be made by the President Neal Smatresk of UNT in a major event at the University. Event will be attended by the leaders of Jain communities from all over USA and also by the academic community of the University and other luminaries. JERF invites all members of the Jain community to participate in this history making event, which will be held at the University of North Texas, Denton on Sept 30, 2016 at 6:30 pm and will be followed by a vegetarian dinner. After the establishment of the Bhagwan Mahavir Professorship of Jain Studies at the Florida International University, this is the second endowed professorship of Jain Studies being sponsored by JERF. On June 26, Jain Education and Research Foundation (JERF) and University of North Texas (UNT) signed a MOU to establish a Professorship in Jain studies at UNT in Dallas, TX. This is the second major initiative after successful establishment of the Bhagwan Mahavir Professorship of Jain studies at Florida International University, Miami in 2010. UNT is one of the largest Tier-1 US universities with student body of almost 40,000 from a diverse religious background. 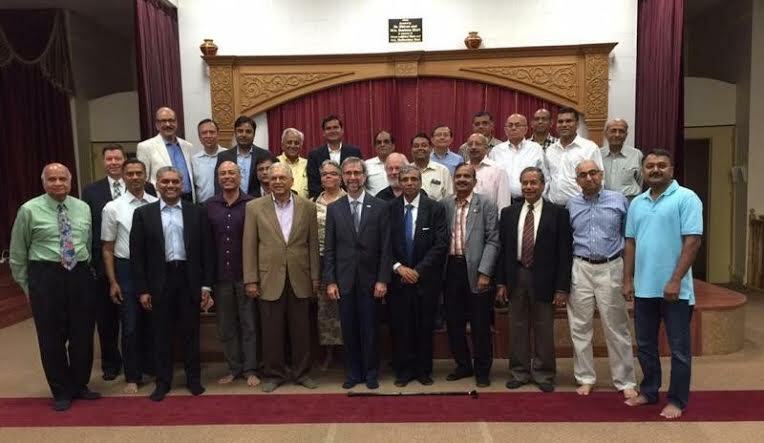 The signing ceremony took place at the Jain Society of North Texas (JSNT), attended by over 100 Dallas Jain community members, JERF Board of Directors, JAINA Board Members and UNT officials. The event concluded with a Jain lunch served by the JSNT community. "No matter the religion, there is always something that can be learned and applied in your life, and in the current state of the world I can see why the Jains would be encouraging others to practice ahimsa and other Jain values. I have started applying some of these values in my own life such as vegetarianism, more conscious awareness and understanding of others around me in the hopes of becoming a better person. I feel that this is part of the reason that schools require theology courses in their core requirements." – An American Undergraduate. Jain principles are not only gaining popularity among Jains but other communities too. One of the key factor to this, is teaching Jainism through education. Click Here to know what other non-Jain students have to say about Jain Course in US Academia.